This week we’ll highlight an item that is both common and unique – Wedding dresses. We have many wedding dresses in our collection, each one as special as the bride who wore it. With our limited space, we DO try to limit our collection to one or two dresses from each decade. 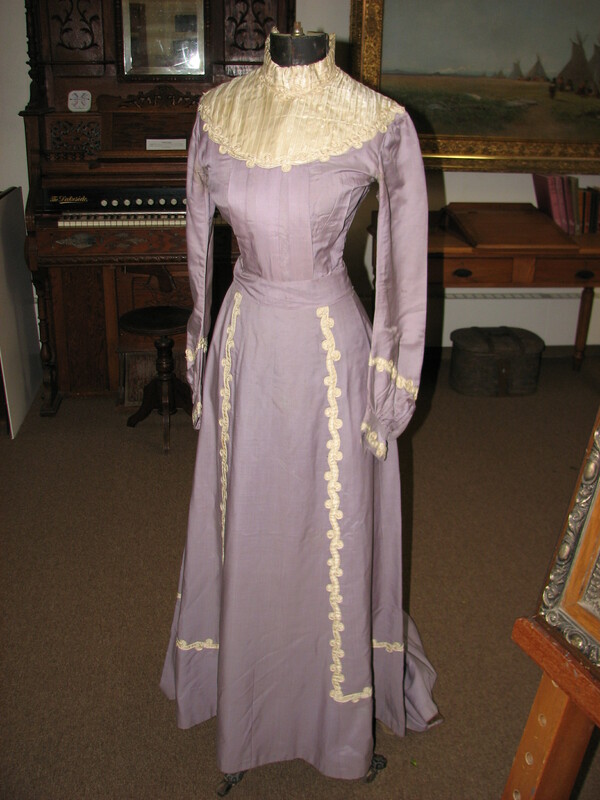 This wedding dress worn by Mrs. Frank Eddy at their wedding June 24, 1885. It is made from taupe colored silk faille and lined with tan cambric. The skirt is ornate. A fold down the front shows five rosettes, fashioned from the material. 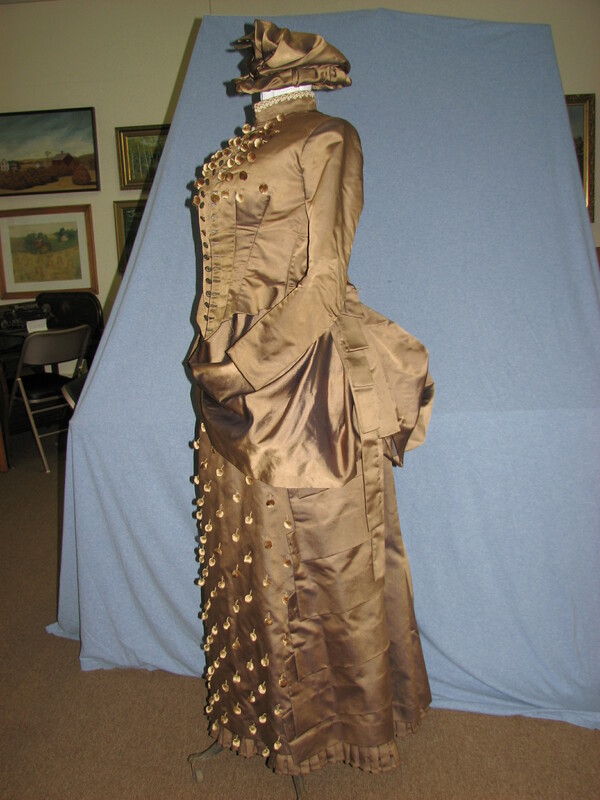 The right side of the skirt has a series of 14 pleats, seven to the left of the panel, and 7 to the right held in straight position by bands of lining sewed underneath in four places. The left side is ornamented with ball trimming, fastened by a loop of twisted cord. Four panniers start at the fold of the front and are draped around the 24 inch waist. A ribbon of material with seven deep loops is at the felt back. The skirt is floor length and is finished at the bottom with a pleated band and a grosgrain tape sewed on by hand. Flom / Hedine wedding dress. Home made of blue gray fabric, pleated front, gathered long sleeves with white swirled trim at the end and part way up to the elbow. The bodice has stays and brown fabric lining. The yoke is pleated white fabric with the same swirl trim. The back is closed with hooks and eyes. 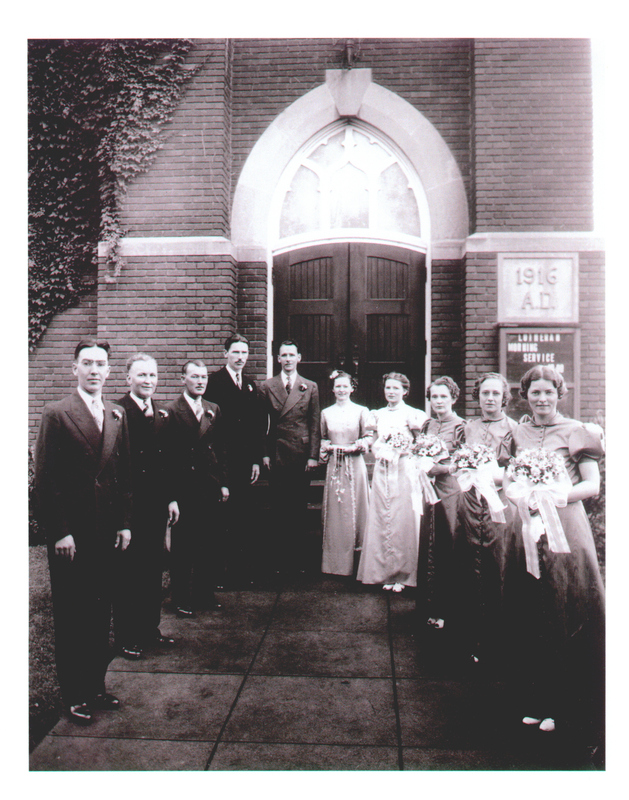 It was worn by Louise Thompson when she married Sam Flom in December of 1902, then by four of her daughters at their own weddings: Marjorie to Marvin Ettesvold in 1933, Hazel to Arnold Flom in 1937, Sylvia to Arthur Long in 1941 and Mildred to John Johannesson in 1959. This entry was posted in Collection Notes and tagged A-Z, Arnold Hedine, Arthur Long, Francis Eddy, Frank Eddy, Glenwood Minnesota, Hazel Flom, Hazel Hedine, John Johannesson, Louise Flom, Marjorie Ettesvold, Marjorie Flom, Marvin Ettesvold, Mildred Flom, Mildred Johannesson, Pope County History, Pope County Minnesota, Pope County Museum, Samson Flom, Sylvia Flom, Sylvia Long, Vintage dress, Wedding dresses. Bookmark the permalink.